The US military uniforms employed two basic type of materials for the buttons in their uniform during WWI; plastic and metal. Many of the buttons were left over from previous wars. However, as the war progressed and old supplies dwindled, new types of buttons emerged and others were displaced. This section of the website provides a look at some of the military buttons employed. The data provided here is brought to you courtesy of MilitaryItems.com, providers of military antiques and collectibles. Come and visit our on-line store. The following is a list of some of the buttons that were employed in the US military uniforms of WWI. WWI US Army Tunic button. Metal construction. WWI US Marine Corps/Army Pants Button. Aluminum construction. 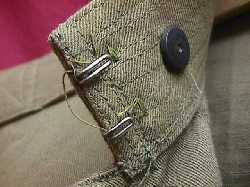 WWI US Army button loop. The buttons were not sewn to the uniform. 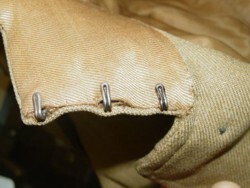 They were secured by using the metal loop shown here. WWI US Army pants ties. 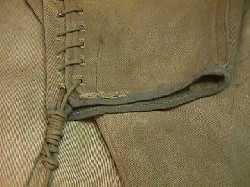 Used to tighten the bottom section of the pant legs. WWI US Army Field belt. Normally employed with summer cotton pants. 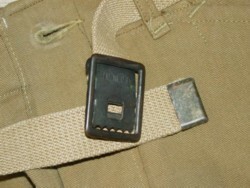 The same type of buckle remained in use during WWII. WWI US Army neck hooks. These are the metal hooks located in the straigth collar were used to keep it in the closed position. 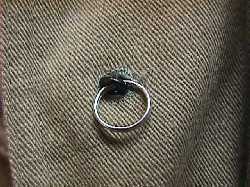 The metal circle seen in the photo is the disc that secures the collar insignia. WWI US Army Flight Corps pilot Tunic collar metal hooks. The collar for the uniform was the tall type. Interesting to see the use of three hooks. Normally two were employed. You can see more information regarding World War One era military uniforms by visiting our American Uniforms of World War One special guide. © 1997 - 2010 MilitaryItems.com - All rights reserved.